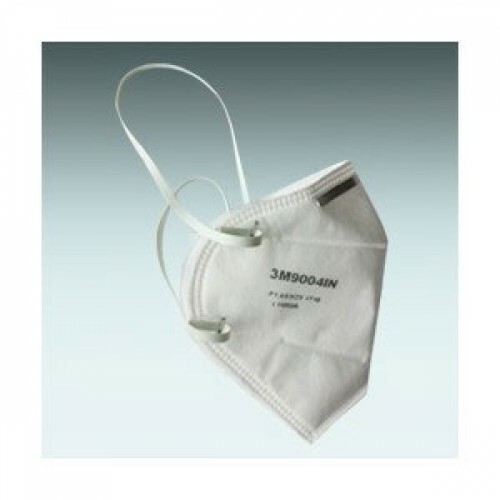 The 3M 9004 IN is a dust mask composed of three layers of filters. The outermost layer filters out the largest dust particles, the innermost layer preserves the respirator’s shape and the middle layer is composed of electrostatic filter media. It has the ability of this respirator mask to filter above 90% of 0.3-micron particulate dusts. (Scientific research has proven thatfor all dust particles sizes, 0.3 micron dust are the most difficult to filter effectively). This 3m mask is used as a disposable face mask for respiratory protection against fine dust particles.It is a bestselling Safety mask in 3m Safety products line. 3M 9004 mask has cup shape design and comes with aluminum nose clip & neoprene elastic band for comfortable fitting on every face. 3m 9004 is not a N95 mask and it is not a breathing mask used in acid/alkaline/gas particles. Filtering efficiency ranging 80% when tested against 0.3-micron sodium chloride particle Can be folded when not in use & slipped easily into the pocket. Do Not use for: paint spraying, sand blasting, gase, vapours, oil mists and in areas where lack of oxygen.